Looks like someone has decided that it is time for Singapore to implement a 4-day school week. A petition has been circulating around the internet over the past few days in a bid to request the Ministry of Education to implement a 4-day school week. 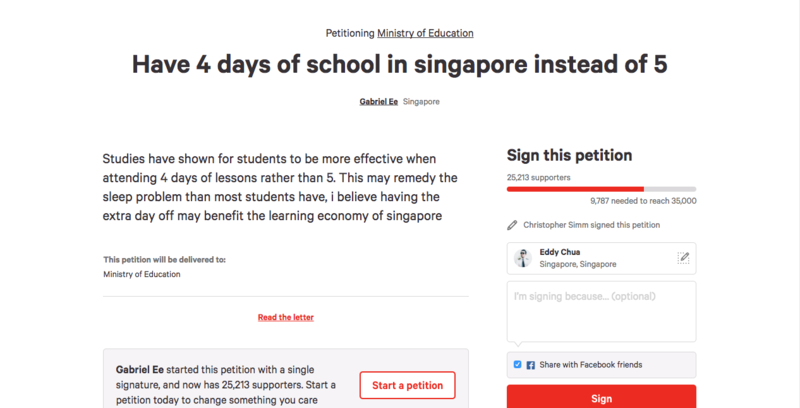 Gabriel Ee, who started the petition on 24 July (Monday), provided the reason that a reduced school week ‘may remedy the sleep problem than most students have’ and he believed that ‘the extra day off may benefit the learning economy of Singapore’. The call to reduce the number of school days is not new. Schools in the U.S. states of Colorado, New Mexico and Wyoming have already cut back on the school days since 2015. However, here’s the catch: In the school that pushed out shorter school week, there also implement longer school hours on the each school days as well. A study conducted in 2015 has concluded that a four-day school week is linked to better academic performance. It was initially thought that longer days on a shorter school week would hurt the academic performances of the students due to shorter attention spans and a longer weekend would mean an increased chance of them forgetting whatever that had been taught. However, after looking at a number of students in each school that scored “proficient or advanced” on state-wide maths and reading test, before and after the school changed to a four-day week, they observed improvements in their results. It was observed that there is an increase from 55.5% of a school’s students on average achieving the top scores before the change to 63.1% after the change. At the time of publication, the petition has already received 25,213 signatures, close to three-quarter of the total amount of people required for activation.